Thoroughly document and interpret the histopathologic effects resulting from exposure of an emerging occupational hazardous agent in wild type and genetically modified mice, focusing on the potential of the agent to induce both neoplastic and nonneoplastic lesions following long-term exposure. Deliver a clear, concise yet thorough pathology report with publishable quality images that could be understood by both the scientific/regulatory community and nonscientists. The results could potentially impact workplace exposure regulations. The test article became increasingly difficult to identify in sections as the study progressed. Cellular location of the test article varied over multiple experiments. Background findings confounded interpretation of study results. Other pathologists had been unable to complete previous studies. 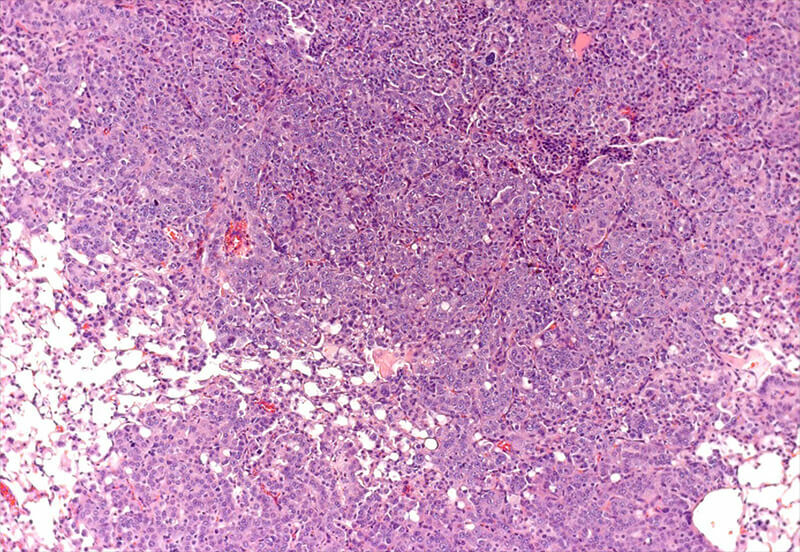 Pursued an enhanced investigation that resulted in identification of morphologic effects that would have been overlooked with a typical histopathologic examination. Performed a systematic comparison of the individual experiments that comprised the entire study, enabling a complete understanding of the pathogenesis of the lesions caused by the inhaled emerging occupational hazardous agent. ILS subsequently received several studies of similar agents from the same client.